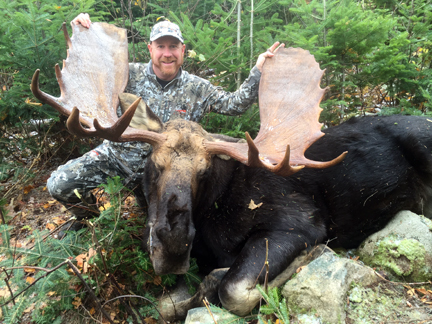 Both of our Moose Permit Auction winners experience great hunts this Fall. The New Hampshire winner said “A great hunt! Got a 775 pound bull with a 53” spread”. Pictured with his moose is camera man Michael Pestana of the New Hampshire Guide Service. Our Massachusetts winner also had a good hunt. He saw over 2 dozen moose, but as a long time moose hunter, was waiting for a big moose with at least a 60” spread. Unfortunately, he had to cut the week short due to illness, but said “Still a great time, and I will definitely bid again next year”. Proceeds from the auction of these permits are a major source of Foundation funding for grants to support the critical education, conservation, wildlife and law enforcement programs of the NH Fish and Game Department. Thank you to both our winners!